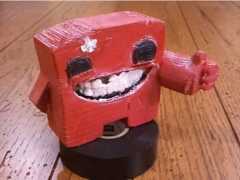 To celebrate the launch of Super Meat Boy on XBLA I wanted to crank out a 3D model of Super Meat Boy on our new 3D printer. The first phase of the model had a few defects, so we had to take it into blender to fix it up. DecoyChunk said it was like a puzzle. I’m glad he figured it out. Printing out 3D objects is the coolest thing.